Discussion in 'Irma's Place' started by Bill USN-1, Nov 13, 2008. Awesome find! Looks like it is in great shape paint wise from the picture. I would keep it the way it is. I'll be picking one up today. Not sure of the model number but the seller states that it is a 1949 model. Says that it works great but could use a new door seal. 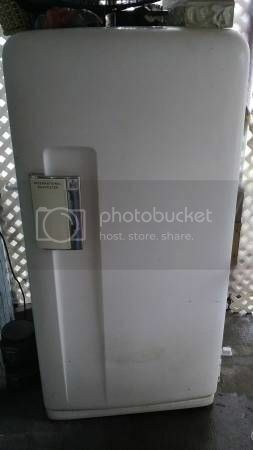 I've been looking for an IH fridge for a while now. Really happy that I found this one. How many of you have painted their fridge to match your IH truck? Not sure if I should leave it as it is, paint it gloss white, IH red, or paint it to match my Scout. EDITED: I picked it up yesterday just outside of Portland, OR. Well worth the 4 hours of driving. If you ever have the chance to drive into Portland do a google search for the food trucks. Portland has about 500 food trucks in the city. There are several areas where you can find 30+ different food trucks all on one block. Food from all over the world. I had Moroccan food for lunch yesterday. I usually go for Tai or Vietnamese food. It really is a cool experience and Portland is a very cool, quirky, weird city. Always worth the drive down. BTW.......I'm really leaning towards painting the fridge IH red. I already have the paint to do some cabinets and my old Gasboy fuel pump. Also, the data plate in intact. I'll post a pic of that later today. 1953 L-14-V standup freezer. Not a refrigerator but none the less a pretty cool freezer and it was free. Just picked it up last week so I have some work to do to get it running. The lights work though. And if you look at the upper left hand corner of the front you can see how well those Mr. Clean Magic Erasers take off all that gunk. If it were real patina, I would leave it but it is just old grime. Hey all, just bought a house and this 1953 pedal open fridge was in the basement. Still works! Good looking fridge and the door seal doesn't look too bad either. Nice bonus find with the house!